The Currency of War is a Learn to Play set for the Legend of the Five Rings Collectible Card Game, featuring comprehensive rules for the premiere Interactive Storyline Game. Jump into the game as a member of the deadly and elegant Crane Clan or the fierce and adventurous Mantis Clan. Join the ranks of the samurai of the Emerald Empire of Rokugan, discover its rich history and get ready to directly impact its future. 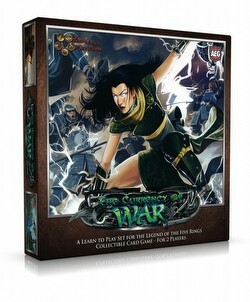 Each The Currency of War set includes 2 Ivory legal, ready-to-play L5R decks (Crane & Mantis), 4 Ivory legal boosters, a 16-page storybook detailing the events of the conflict opposing both clans, a fully illustrated and comprehensive rulebook, and an exclusive vote that will allow you to shape the future of Rokugan.